Noah Smith beat me to the point. He has an excellent review of John Taylor's paper (co-authored with John F. Cogan, Volker Wieland, and Maik Wolters), which he recently used to argue in favor of Paul Ryan's latest budget in the Wall Street Journal op-ed. A while back when Taylor was promoting his austerity plan on his blog, I read Taylor's paper and arrived at a similar judgement as Noah, summarized below. Second and more importantly, Taylor assumes that the Fed will respond to fiscal austerity by dropping interest rates to well below zero. He does not explicitly state that, but it is implicit--his model assumes the interest rate will be determined by a Taylor rule with no zero-lower-bound. There are strong theoretical reasons to believe that the Fed is not capable of following the policy path that Taylor assumes, because if the Fed tried to lower interest rates below the current level of 0%, then investors would simply withdraw their funds in the form of cash, and hold it at 0% nominal interest anyway. Cutting taxes causes people to want to work more. In order to employ more workers, the wage must fall (think of this as movement down the labor demand curve). A falling wage means we have deflation (in reality, disinflation). Because we are already stuck at the zero lower bound, the nominal interest rate cannot fall to offset the deflation, so the real interest rate rises. The higher real interest rate causes households to spend less in an effort to save more (think of this as movement down the aggregate demand curve). Hence the result that a tax rate cut decreases employment. Gauti Eggertson is the man you want to read if that makes no sense to you. But this is an incredibly important point, since all of Taylor's results depend critically on the notion that inflation will rise immediately after the tax rate cut. In the absence of monetary expansion, inflation would actually fall, not rise, so implicit here is the idea that the Fed would engage in massive quantitative easing to offset the deflationary effects of the tax cut. Third, Taylor's model assumes we are an open economy in a world where our trade partners are not in recession, so that austerity in the US will raise the exchange rate and boost net exports. Now, the growth in net exports is not terribly large, but the problem with this result is that in reality our trade partners are also at the zero-lower bound, so our efforts to increase net exports will just further reduce foreign demand for US exports, making the effort self-defeating and contractionary. When we are experiencing a world-wide liquidity trap, export-led growth isn't possible. So this is just another way in which the model is overly optimistic about output under fiscal austerity. with perfect price flexibility, government transfers have a lower multiplier than government consumption. In fact, even completely wasteful government consumption spending can be expansionary in the short run, regardless of the state of the economy. Taylor would be wise to be a little more honest about this. The Ryan budget calls for cuts to a wide variety of programs, and to the extent that any of that spending is an imperfect substitute for private sector spending, cutting it would be contractionary not expansionary. Christiano, L., Eichenbaum, M., & Rebelo, S. (2011). When Is the Government Spending Multiplier Large?. Journal Of Political Economy, 119(1), 78-121. 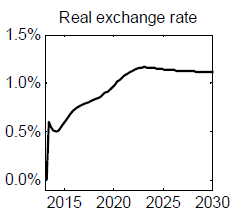 The whole point of this paper is to say that the standard flexible interest rate New Keynesian framework dramatically understates the spending multiplier when we hit the zero-lower-bound. Taylor completely fails to acknowledge that the zero-lower-bound is any different than normal times. Also, Christiano is a pretty famous freshwater economist known for his work in the RBC literature and fairly popular among conservative-leaning circles. Even if Taylor thinks Woodford, Krugman, Eggertson and others are misguided, he ought to be aware that "the other side" of the divide also does not agree with him.